Borage, a beautiful flowering herb, borage blooms from June to August. It can be quite a challenge to shoot, but master the technique with our top tips for photographing borage blooms. 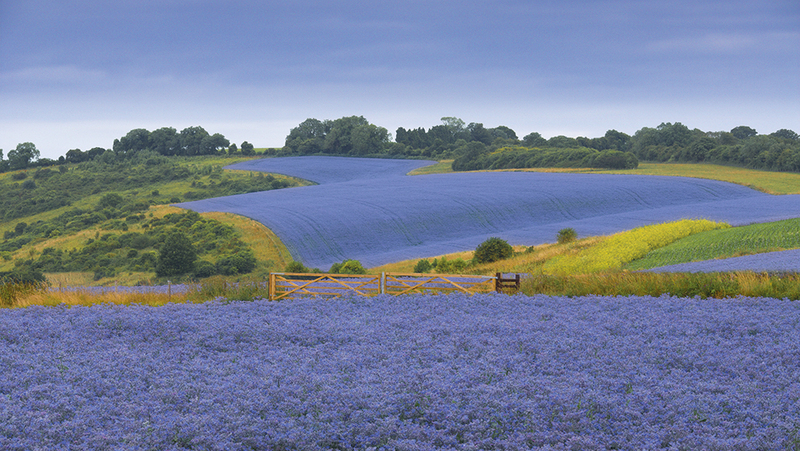 With poppies and lavender a firm favourite with photographers at this time of year, it’s easy to forget about borage. A beautiful flowering herb, borage blooms from June to August, and while it’s native to the Mediterranean it is hardy enough to grow in the UK. With its vivid blue flowers, borage is a popular choice with gardeners, and the cucumber-flavoured leaves can be used in summer drinks or the flowers used as decoration. Borage is also grown on a commercial scale, cultivated for borage seed oil, so it’s possible to find large fields full of vibrant blue. While the flowers are plentiful, they are also quite small, making them a bit of a challenge to shoot. However, you can make the most of each situation by searching for any possible focal points. One option is to shoot from a low level with a telephoto lens. This will effectively compress the swathes of flower heads to make them appear more densely packed and therefore stronger in colour. If you want a wideangle view that encompasses the surrounding landscape, be sure to move in very close on the nearest flowers (using f/22 for sufficient depth of field), so they’ll loom large in the foreground. Unlike lavender, borage isn’t planted in tight lines, so building some linear perspective into the image is difficult. Consider including hedgerows or stone walls as lead-in lines to help convey a feeling of depth. Borage is quite a bushy plant, which means that the ‘tram lines’ (the twin tracks commonly seen in crop fields, which are handy for adding structure to compositions) become overgrown and indistinct.